Dive into a Red Sea holiday at the Hilton Sharm Dreams Resort hotel, with its onsite diving center, casino and 7 pools. Kids will love the Kids' Club, and the water park and private beach are just 200 meters away. Located in Naama Bay, the resort is a haven for watersports. Dine alfresco Italian style at Casa Sharm restaurant or enjoy a poolside barbecue at the swim-up Pool Bar. Make use of the nearby fitness center and tennis courts. Or take a trip to Sharm El Sheikh, just 15 minutes away, for a range of watersports and other attractions, including camel rides.Fifteen minutes' drive from Sharm El Sheikh, the Hilton Sharm Dreams Resort hotel has a meeting room for 16-220 with wireless internet access. Business facilities are available.From Hilton Guest Room to Junior Suite, all rooms have high-speed internet access. Upgrade to a Junior Suite for a patio with partial garden views. Feel at home in this spacious, contemporary 32m²/344sq.ft room offering a separate seating area with sofa. Catch up on work at the desk, check your emails with high-speed internet access or pamper yourself in the marble bathroom. Some rooms have a patio, balcony or mountain view. Make this luxurious, modern 64m²/689sq.ft suite your home from home with a separate dining area, a living room, a 2nd bathroom, a patio and partial garden views. Catch up on work at the desk, surf the web with high-speed internet access or re-energize in the marble bathroom. Dine alfresco on the terrace overlooking the pool with sweeping Sinai mountains views at Le Jardin restaurant in the Hilton Sharm Dreams Resort hotel. Choose from hot and cold breakfast buffets, lunch buffets and themed dinner buffets, like Egyptian or seafood, at this informal Sharm El Sheikh restaurant. Savor Italian dishes like seafood risotto and lasagna at this Sharm El Sheikh restaurant. Bring all the family for pizza in the Italian-style setting, with wrought-iron chandeliers and open-counter kitchen. Or book a table on the terrace overlooking the pool at the Hilton Sharm Dreams Resort hotel. Watch the chef prepare Mexican specialty quesadillas from the open-counter kitchen of this Sharm El Sheikh restaurant. Share nachos or a sizzling shrimp and beef platter on the terrace. 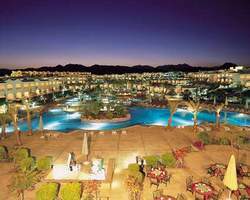 Enjoy views across the pool of the Hilton Sharm Dreams Resort hotel to the Sinai mountains. Services: Small pets welcome (1 pet per guest).